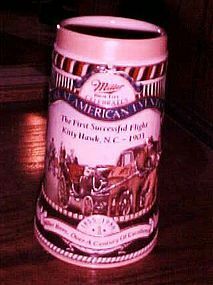 This is a Miller High Life Collector Edition Beer Mug. This is "The First Successful Flight Kitty Hawk NC-1903, from the Great American Events Series. This is 7 inches tall, and is a numbered Stein. Perfect condition. Verbano Italy Ashtray. 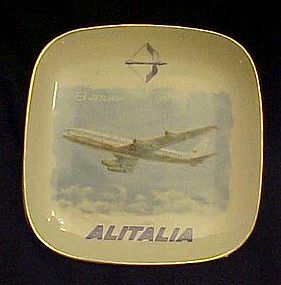 A nice vintage Verbano ashtray/dish made for Alitalia Airlines. It features the DC-8 Jet. It measures just under 5" square and has gold trim. Very nice condition, with no wear or damages. Great airline piece for the aviation collector! International Silver vintage flatware is a silver plate inflight dessert spoon Marked TWA. Measures 5 3/8" long and is in good vintage condition. 1950-s -60's era. A wonderful airlines collectible. This pretty turquoise blue glass ashtray with white imprint is from Kennedy airport. 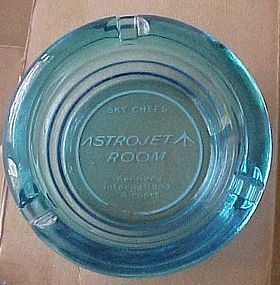 Says "SKY CHEF'S Astrojet room, Kennedy International Airport". Measures 4 1/8" wide. No chips or cracks. The white imprint is 95%. A light spot on the Kennedy airport area and the bottom ring. A simply wonderful addition to your airline memorabilia, or your vintage souvenir ashtrays. I have hundreds of original vintage airplane and airline related advertisements from 1930 thru 1975. They are all full page adds, some color and some black and white. All have been carefully removed from old magazines. Pan Am, Japan airlines, TWA, South Western,Delta, and lots more. Let me know what interests you, and I will see what I have for you.